I was captivated by this figure from the first moment I saw it and was honored that my wife’s grandfather wanted me to have it. 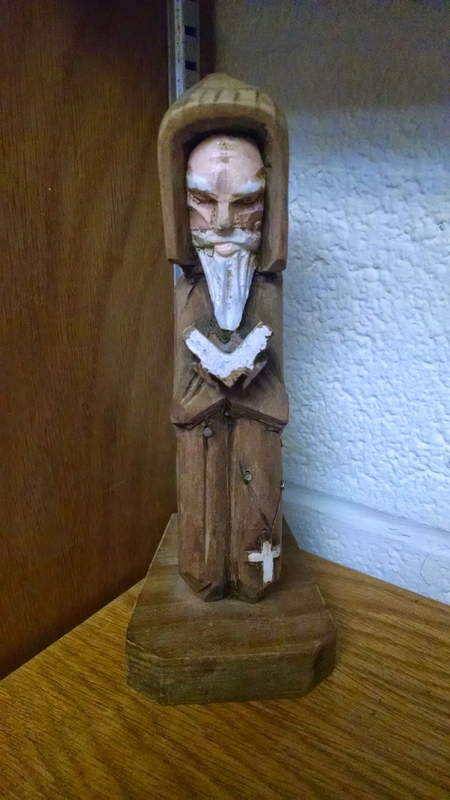 It’s a simple piece; beautifully carved in Mexico that, by some divine providence, has made it’s way to my study; where it now sits (actually, it’s kneeling). The figure is seemingly bowing it’s head in prayer as it meditates on scripture; showing me a faithful engagement with God through his holy Word. The figure’s face is determined, peaceful and focused as it holds the Word of God. I Imagine him reflecting on a passage he just read and listening; listening intently for the voice of God, hence the determined face. He’s at peace because not only is he cradling the Bible but he feels cradled by the promises of God that he is reflecting on, hence the peaceful face. He also seems to be in his own little world as he meditates on God’s Word; not drawn away by the lure of cultural forces, hence the focused face. I gaze at this figure and notice the cross dangling at his knees. For him it is not just some piece of jewelry or something to adorn his outfit. The cross is something that brings him great joy and hope (as it does me), thus the attitude of worship that I also see emanating from his face. I gaze at this figure and I almost feel guilty; like I am invading his privacy as he worships. Sounds weird and goofy and maybe a little disturbing, but as I am gazing I notice something else. I notice that I am being drawn into worship as I reflect on him reflecting and on whom he is reflecting. I find myself drawn to enter a time of prayer; engaging God through scripture; and I like this. For there is much the world wants me to embrace as truth but I refuse to embrace that truth. For me, THE Truth is God almighty through Jesus Christ my Lord. And that Truth is found in God’s most holy and inerrant Word. I gaze at this figure and see a person; loved by God and loving his God. I see a person who would readily acknowledge that he is a redeemed sinner. I see a person who devotion to God is not only in his moments on his knees but in every moment of his life. And I like what I see. Holy God, I am thankful for the many ways You speak to me and proclaim Your amazing love to me. You do so through Your most holy Word. You do so through people in my life. You do so through “usual” means which just shows You are not limited by anything or anyone. Thank you, Father, for the right to be called a child of Yours, through Jesus Christ my Lord, Amen. As you gaze at that figure, what do YOU notice?